The total rate of opioid users in WEC was 18.9% greater than the provincial rate of opioid users; when compared to 49 other regions in Ontario, WEC has the 7th highest rate of opioid users. Substance abuse is a serious and increasingly costly health issue in Canada. The cost of hospitalizing people with substance use disorders (SUDs) increased 22% over five years to $267 million in 2011 from $219 million in 2006, according to CCSA’s report on SUDs and hospital use. Alcohol was the substance most responsible, costing 54% of the total cost of SUD-related hospital stays. As health providers, we’ve seen first-hand the lives saved by harm reduction services. Since supervised consumption services and overdose prevention sites began opening in mid-2017, they’ve already saved 917 lives by reversing overdoses. With 1,400 lives lost from opioid overdoses in Ontario since the beginning of 2017, we are starting to make a significant difference. That’s 917 families who didn’t receive the worst news possible. That’s 917 people who still have a chance to build a better life. It should be noted that this letter was signed by 18 people in the Health and Wellness Industry. If it is about money, Minister Elliott needs to look at the cost of $38.4 billion a year that is presently being spent. The purpose of Overdose Prevention sites are to SAVE LIVES, and also reduce the costs of hospital visits. A criminal enterprise? There will be Naxalone kits there whose sole purpose is to save a life. What are Fredericks options that are open to us? How can it be considered criminal behaviour to not administer a life saving device. If you carry an epi-pen and see someone who is having an allergic reaction you would not think twice. Or the Heimlich manoeuvre if someone is choking. 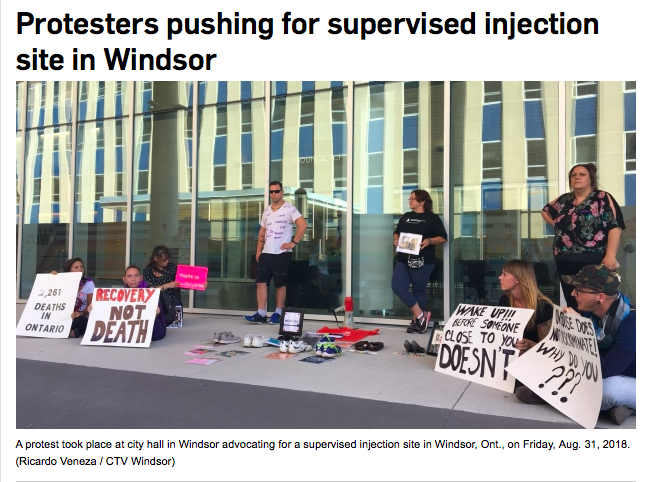 People are injecting themselves in a variety of places in Windsor. The Police are constantly patrolling and waking up these individuals to see if they are alive. It only makes sense to have a safe place. “Every human being whose life is in peril has a right to assistance…Every person must come to the aid of anyone whose life is in peril, either personally or calling for aid, by giving him the necessary and immediate physical assistance, unless it involves danger to himself or a third person, or he has another valid reason. Ontario’s Good Samaritan Act. Ontario’s Good Samaritan Act protects a rescuer from any liability should they attempt to help a victim in distress. … The Good Samaritan Act ensures that fear of legal repercussion never stops someone from trying to help in an emergency. We need to put more pressure on our Minister of Health, and our Premier to make sure that no more lives are lost that could have been saved.